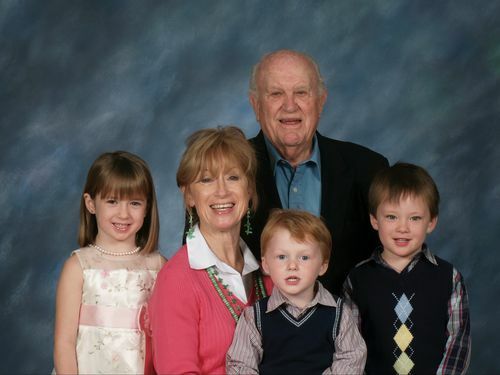 This is Charlene Hickman Worrell, her husband Dub Worrell, and the grandchildren they are raising. After a conversation on the phone with Ray, Charlene sent a couple of photos and this greeting. “So sorry I cannot attend, but my family commitment keeps me from coming. My retirement plans did not include raising 3 kids . . . and going to soccer and baseball games . . . but the Good Lord had another plan for me as you can see. My two biological grandchildren and their 1/2 sibling all live with us up here in BlueBell Country. Thank goodness we're here and not still in Houston. My husband and I adopted the 1/2 sibling so we could keep them together. They are 3, 5, and 7. As you can imagine ~ life is BUSY!!!! Hope this reunion will find everyone in good health! Please tell everyone 'hello' for me. Charlene"